Sunday again, at my house this time. And once again I need a pan loaf for sandwiches! I started flipping through Bread Baker’s Apprentice looking for my next target. 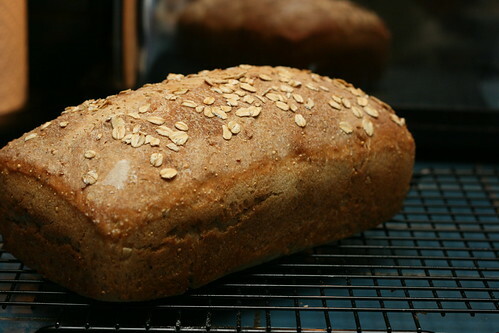 The Multigrain Bread Extraordinaire caught my eyes, without so much as a picture! 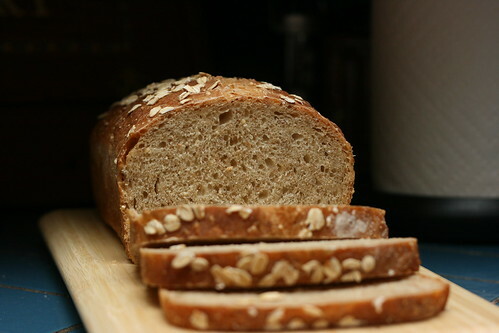 People who know me probably wouldn’t be surprised by this, because as much as I love various artisan breads, whole wheat or multigrain anything will make me sit up and take notice. And no, I don’t eat cardboard in my spare time. 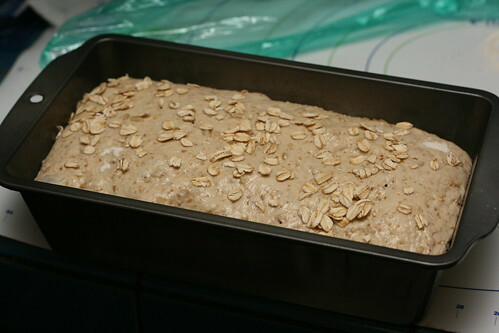 The first step was to figure out what grains I was going to use in the bread. 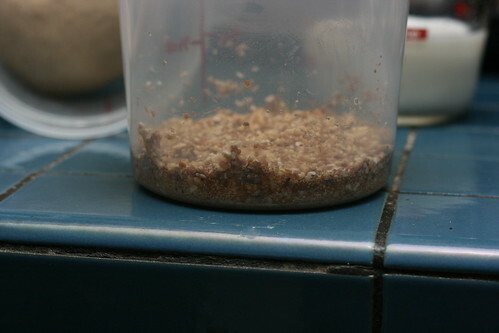 The recipe called for 3tbsp of either corn meal, amaranth, millet, or quinoa; 3tbsp of either rolled oats or wheat, triticale or buckwheat flakes; and 2tbsp of wheat bran. I decided to go with 2tbsp amaranth, 1tbsp millet, 2tbsp rolled oats, 1tbsp buckwheat cereal (not as small as flakes, but who’s counting? 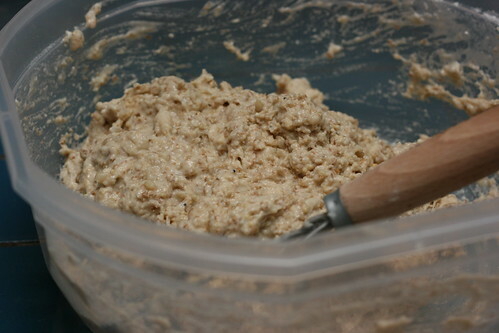 ), the 2tbsp of wheat bran, and 1tbsp of flax meal. I’d also decided to deviate a bit from the recipe and make it sourdough. I already had my starter out to refresh (Friday night), and I had some leftover that I wouldn’t be able to use for anything else, so why not right? 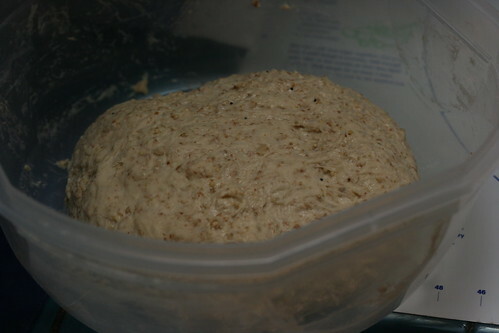 I used the starter to make a small stiff levain (which I meant to build Saturday, and forgot). 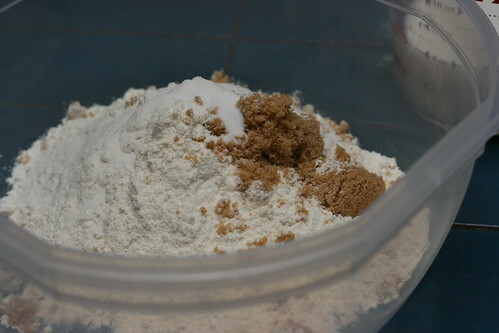 I wasn’t particularly following a recipe for that part, so I wrote down the amount of flour and water I used so I could account for it in the recipe for the loaf. Attack of the stiff levain! 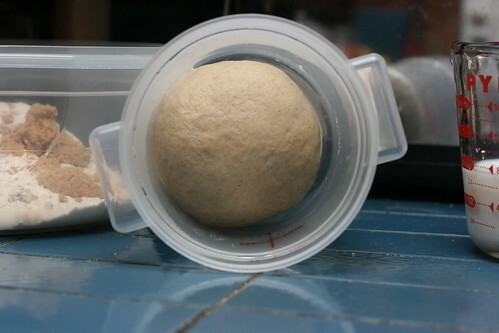 After a bit more mixing, adding a little bit of flour, doing some stretches and folds, the dough finally reached a point where I could actually handle it. 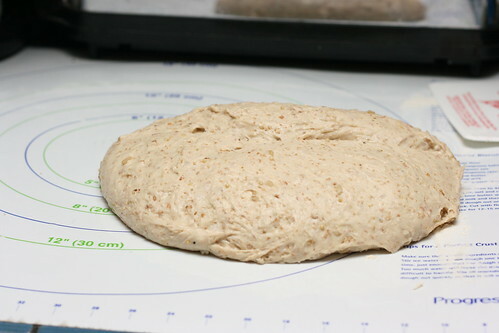 It still was quite sticky and gummy though, definitely unlike other doughs I’ve dealt with so far. As I mentioned, I forgot to do a build of the stiff levain I made for this loaf. 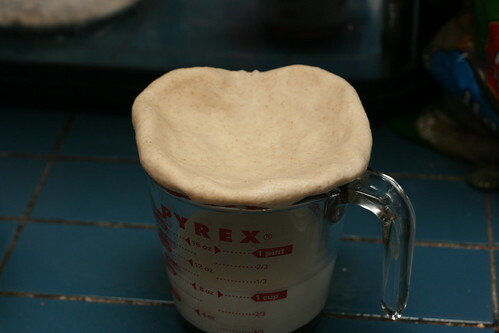 So it took a very long time to rise, in fact, at one point I wasn’t even sure it was going to rise. 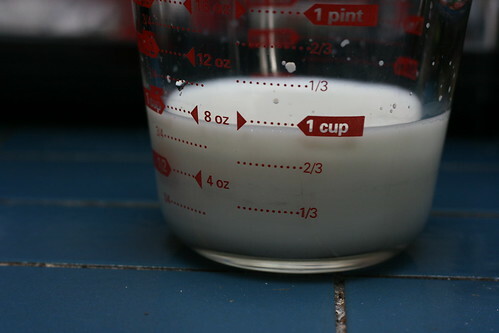 What made it especially hard is that my sourdough starter really doesn’t do most of the rising until the oven. 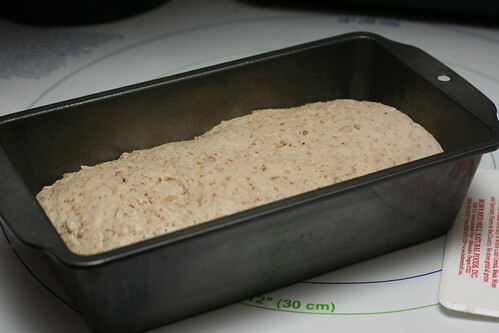 So, I gave the dough plenty of time and a few more folds, it had finally grown some and didn’t spring back on a poke test, so I shaped it into a loaf and plopped it into a pan. In the loaf pan it didn’t take quite as long for the second rise, but it was getting late and I really needed to get to bed, so that was all the rising it was going to do! The bread looks good. Hope it tastes as good.